December 22, 2018 Robyn L.
I didn’t get out of bed until 9:30 this morning. I wasn’t asleep right until then, but I dozed on and off for a couple hours before sweatpants and reading socks sounded too good to put off any longer. So here I sit. Couch potato-ing merrily by the Christmas tree as I write this. I usually take the same holidays as the schools since my work schedule with my private students revolves around the school year as well. Being back in a school this year has made me all the more anxious for a break, as I am all the more exhausted with a much more challenging job. I teach classroom music to kindergarten and grade two. It is constant stimulation from the moment the first class arrives in my music room and this highly sensitive introvert gets pushed out of her comfort zone a lot. But I don’t regret pushing myself to take this position. I had an additional two nights of Christmas concerts this year which went over just fine, and then last weekend my own students had their own Christmas recital. Now that I’ve had some of the same kids for 5+ years, it’s been neat to see how their families have become part of my community. I see the same parents and grandparents twice a year, and it’s honestly a special feeling for me to look out and see the familiar faces of those who support their kids and ultimately support my work with them. It’s humbling and a good reminder of the impact I can have on these kids, when it’s easy to get lost in the daily slog of just getting through the work day. 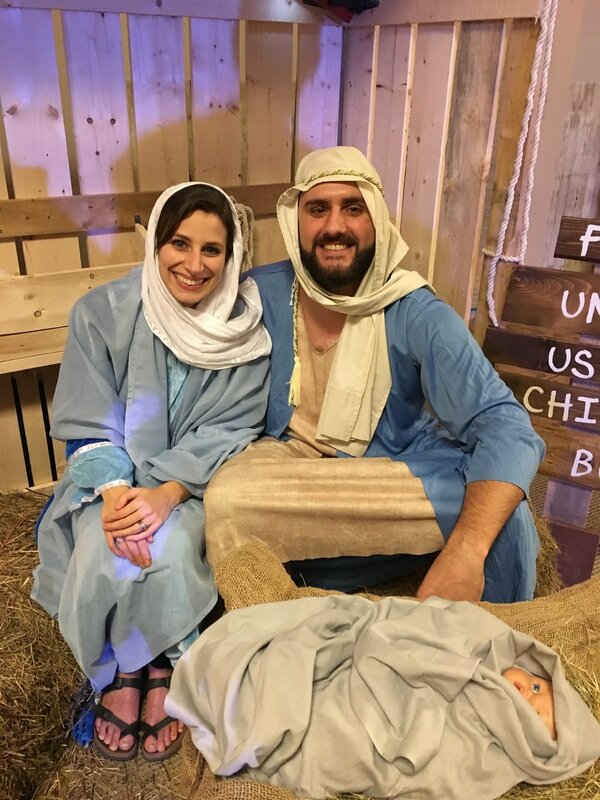 Our church also put off an event called A Night In Bethlehem for the second time. It went so well last year, we had to find a bigger space to hold it this year. Dave and I also got asked back to play our feature roles as Mary and Joseph. We even got our photo in the Western Star. (Hello 15 seconds of fame, now immortal in print and online.) These are such fun memories to have with our church family, I’m so glad we decided to do it again. December has clearly been busy, as per usual. And as I’ve noticed when the end of November rolls around each year, I tend to feel a spike in my levels of anxiety as the holidays get closer, even when I’m actually really excited about them. But I’m really grateful it seems to have subsided, and I know that I need to reach out and be proactive about it. I’ve been using this app called Abide, (#notsponsored) which I can’t recommend enough. I use it to help me fall asleep a lot of nights, and have been turning on a 10-minute meditation before I even get out of bed in the morning to help put my mind at ease and start the day on a good God-centered note. If this is a difficult time of year for you, for whatever reason as there can be many, I pray that this season brings you peace and healing. I know it’s not always a holly jolly day for everyone, so just know you are thought of and loved. And don’t forget to reach out- so many scary things get less scary when you speak them out loud and let friends and family shine a little light on them. Since there is a -658% chance of me posting again before Christmas, given my posting history and all, I’d like to take this opportunity to wish you a Merry Christmas. Over here at the La Rose house you’ll find us enjoying down time, family time, brunch time, and Walter time (all the time) over the next few days. Are we sad for being excited that it’s our first Christmas with our Good Boye? Given that he literally will have zero idea that Christmas day is any different from a normal day? Probably. Not sorry. October 5, 2018 Robyn L.
I love Thanksgiving, like any other North American young adult female. All the fall things, the pumpkins in abundance in store displays, harvest-themed wreaths on doors, the explosion of colourful leaves that can be seen everywhere as you drive through the winding, pothole-ridden roads of our forest town. It means a long weekend, a day off work to recover from turkey comas, to sleep in and sip coffee a little slower, maybe more family time or an afternoon to watch too much Netflix or read a good book. It comes just long enough after the start of the school year to be appreciated but not exhaustingly necessary. I just love it. And it’s always the reminder I need to pause and really think about just how much I have to be thankful for. I try pretty regularly to be thankful for my material blessings. I know that owning a vehicle and a home before 30 isn’t a reality for everyone. I even feel sheepish for writing that, like I’m somehow bragging about my privilege just for stating it. But I think the greater travesty would be to forget to show gratitude and to keep expecting that bigger and better things be handed to me. This year, I’m grateful for all of that- the stuff and the opportunities that have been afforded to me because I live where I do and what we’ve worked for. But stuff is just stuff and with each passing year, that sinks in a little more. First and foremost, I am so grateful for days of good health, that I have come so far since the beginning of this year in body + mind + spirit. For the shifting that’s still happening so I can know that I’m learning. This year I am grateful for what really matters; friendships and family, the ability to learn from hardship and mistakes and to press on. For the realization that life’s surprises aren’t always unpleasant ones. For gifts and talents that God gave me and the way He created me to feel closest to Him and most fulfilled when I use them. The people He’s placed in my life to mirror His love. For unexpected messages from old friends and impromptu meet ups. For laughing until my cheeks ache. For Dave, my rock and #1 fan who has kept me buoyed through each wave of despair that threatened to overtake me these past 11 months. I would be remiss to forget the little things, too. A renewed ability to drink coffee after taking a long break to let my hurting body heal. The feeling of Walter’s fluffy and springy curls on the top of his head when I pet him. Finally finding a really good pumpkin spice latte in Corner Brook. I’m grateful I could create the perfect fall decor with a bunch of dollar store pinecones in a little wooden bowl given to me as a Christmas gift. For the houseplants I haven’t killed yet and are somehow still thriving. For McDonald’s chicken nuggets and pancakes (enjoyed separately, of course.) 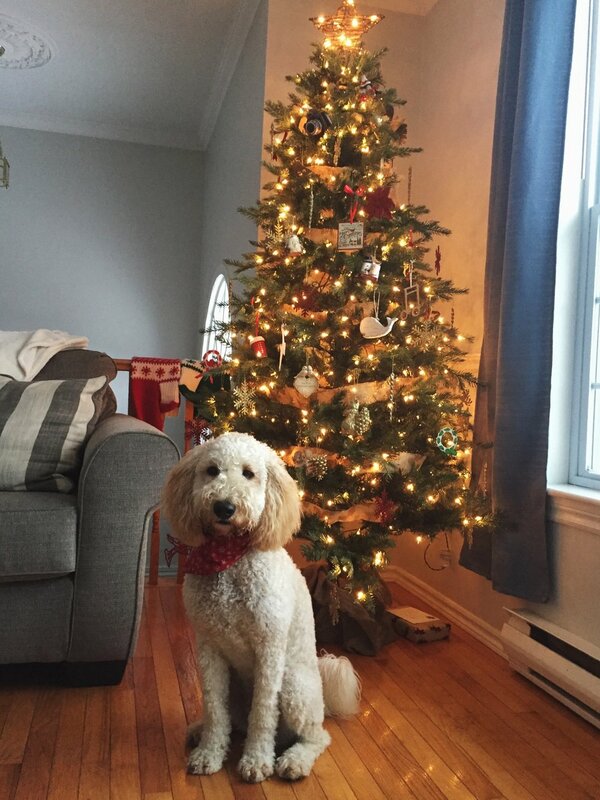 For the golden doodle hashtag on Instagram. Purchasing the perfect pair of dark green skinny jeans after a year-long search. For the children I work with each week who keep me entertained and challenged. And for a new career opportunity I might share more about soon: a totally unexpected new job as a part-time music teacher to kindergarten and grade two that I’ll be starting next week. Didn’t see that one coming, but you better believe I’m about to dive into this new season with gusto ( + a little fear/trepidation). So as I sip my coffee from a mug adorned with a picture of a squirrel amidst floating leaves and acorns, waiting for my hubs to come home from a bike ride so we can start the long weekend, my heart is just full. I can’t wait to slow down over these next couple days, get cozy and finish my current audio book, eat turkey and live the cabin life. I’m also grateful for anyone who’s ever stopped by this little space of mine to read these sometimes ramble-y thoughts. I really like writing them, and as I continue to place less importance on who will appreciate them or validate them, I feel emboldened to maybe start sharing more of them. Whether you’re in Canada and celebrating with us this weekend or not, Happy Thanksgiving. May your heart be filled with thankfulness and your mug be filled with pumpkin spice. August 23, 2018 Robyn L.
Hi friends. It's been a hot minute over here since my last post, and for that I am truly sorry. Somehow the months have gotten away from me, and now we're nearing the end of our short-lived Newfoundland summer. I've wanted to post, but it has been quite. the. year. and it's actually been quite a challenge to know where to jump in. I think I've been holding onto the idea that I would post something again when I reached a point where I felt like things were resolved with my health, so I could turn the page on that chapter and just resume sharing photos of Walter and our weekend activities. But life is not neat and tidy like that, is it? The journey towards any kind of health is always ongoing. So I believe the posts must go on (see above photo of Walter), despite the in-conclusion I'm still experiencing. I was listening to a podcast the other day, one about relationships. The host was talking about seasons within marriage, and how he tries to view them all equally- some are more painful or easier or fuller or less memorable than others, but they all serve an important purpose in a different way. One is not more or less valuable, they're just different. When you remember that, you don't get caught up in wishing time away. It frees you up to experience gratitude for what you learn and take away from each season. Perhaps that's the best way for me to put into words where I'm at currently. In December, anxiety crept back into my life. I started worrying about what each day might bring and whether I could do another day like the last. I've experienced just how little control we actually have in life in a way that was almost foreign to me before I "got sick". It was jarring and I absolutely felt like the proverbial rug had been pulled out from underneath me. Didn't God know I had a PLAN to stick to, for goodness' sake? Goals and dreams that needed to be realized in this calendar year and could not possibly be pushed back? Since we're all friends here, I'm not going to lie. It's just been super, duper crappy. Yet (PRAISE for the yet), all through that time, I experienced moments of God's grace that He never could have supplied to me in my times of joy and ease. If it were up to me it wouldn't take suffering to experience them, but His ways are indeed mysterious and it's not my job to know why He gives the way He does. On the days when I'd had all I could take and could do nothing more than sob in a broken heap on the floor, He gave me my husband to love me and hold me and help bear my pain. 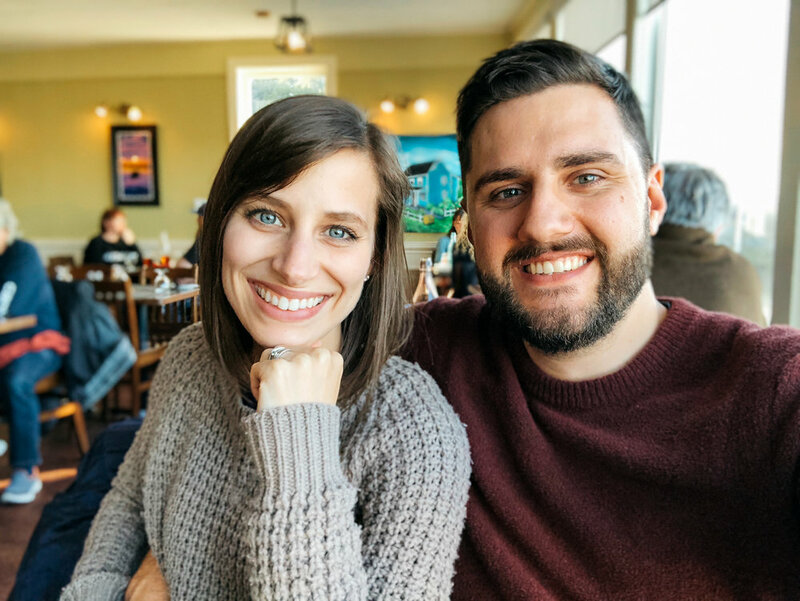 When I decided to cut out all kinds of foods to give my body time to heal, He helped me fight the daily and relentless temptation to continue my unhealthy eating habits and make positive changes I never would have if I hadn't arrived at a place of necessity. When I felt so overwhelmed by fear of the future, He reminded me of verses like Deuteronomy 31:8 to memorize and speak over myself. He gave me conversations with people who said exactly the right words at exactly the right time. He reminded me that there were people praying for me. He gave me moments and days of care-free fun; a trip to Florida, days at the cabin, evenings to escape with Netflix or a good book. He even gave me Walter, the furry, sometimes turd-y, friend whose company I couldn't have known I'd need and love so much. And He continues to provide for me with a deeper understanding that no matter what we face in this life, He is the one thing that is truly unshakeable and unchanging. I know that with my whole heart because He is close to the broken-hearted. I felt completely broken and at the end of myself, and then God showed me this was the only way for me to understand how much I needed Him and that when I am weak I am strong. I wanted to wait to post until I could say I was out of the woods and that I had my life back. But here's the thing. Sickness, crappy moods, anxiety, unfulfilled life goals, having to wait, being disappointed. These are all just parts of life and we don't always get to choose otherwise. I can't get back all the moments I spent working myself into a panic because things seemed to be taking a different trajectory than I'd hoped and planned. But going forward, I can accept each part without desperately fighting against them as though they're foreign and they don't belong here. Yes, even our hard times, dare I say especially our hard times, serve a necessary and meaningful purpose to grow us into the people God has created us to be. As much as I wish there was a way we could learn these lessons without hardship, it just ain't so. Perhaps the downswings in life are intended to prepare us to experience the fullest joy in the soaring upswings. I feel stronger than I did before I entered this season. I'm more hopeful. I'm more empowered, and I know God has GOT THIS because He's used my suffering to teach me so. I don't have to understand, I don't have to come up with the answer, and I don't have to try to predict what might happen tomorrow. I just have to trust that He is working all things together for my (and your) good. May 29, 2018 Robyn L.
There's a popular Newfoundland song - perhaps THE most popular Newfoundland folk song- called I's the B'y. If you're not from the Rock (our nickname for Newfoundland), this translates to "I'm the guy", and the song details exactly who "the guy" is. If you're a Newfie, you're undoubtedly singing the song in your head right now. 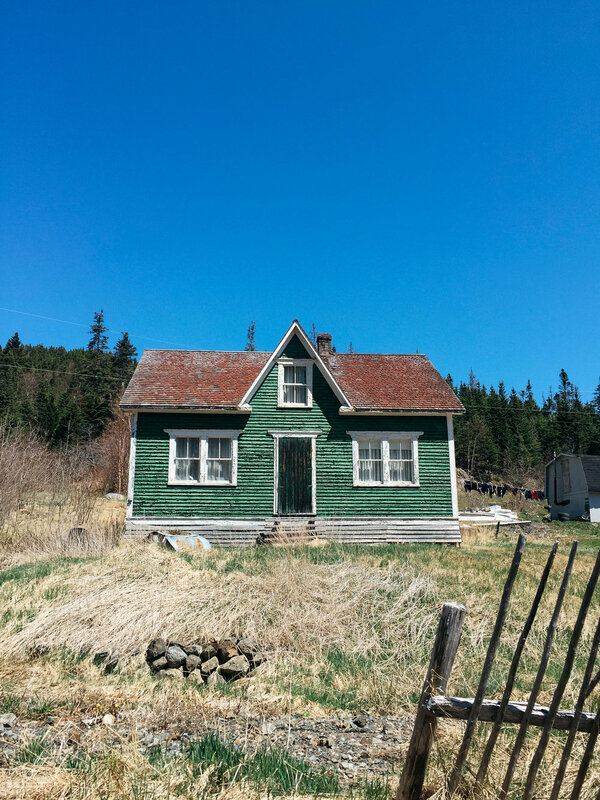 When we set out to spend the May 2-4 weekend in Twillingate, we didn't have any intentions of traveling very far outside, but when we considered how doable a day trip to Fogo was, we just couldn't resist. It was a pretty grey day, and we all donned our winter coats as per the Victoria Day weekend tradition of freezing temperatures and a possibility of snow. 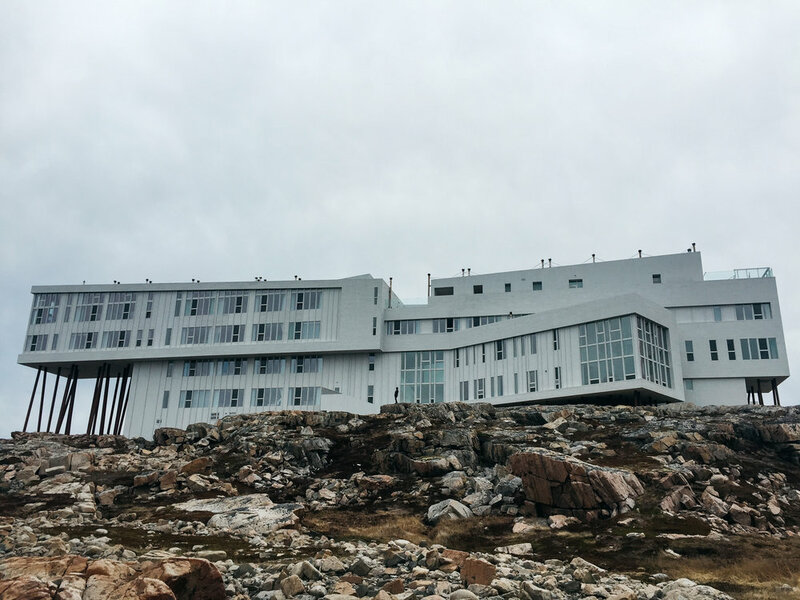 The overcast skies really give Fogo its moody feels and that's kind of part of the experience there. When Dave and I traveled here in 2015 for our mini moon, we splurged on a meal at the Fogo Island Inn. We kind of enjoy telling the tale about how awful our food was, but we've heard of other people really enjoying the food there so we chalked it up to a bad coincidence that we hated everything on the menu that night. This time, we just admired the inn from the outside and picked up food at the grocery store instead. Once we had completed the Fogo leg of our trip, it seemed like a shame not to head to Moreton's Harbour. So off we went, just for the heck of it. Back in Twillingate, we witnessed two beautiful sunsets and a few icebergs here and there. I've been hearing that the number of 'berg sightings is down, so I guess we were fortunate to see the few we did. I'm still waiting for an opportunity to see one up close and personal, but TBH, it would probably go a lot like this. We had a lovely meal at the Anchor Inn, and I have to give them a huge shoutout for meeting my very demanding diet restrictions. Not only that, it was quite delicious despite having to leave out the apple compote, dressing and spices on my salmon. Dave and our friend Sean frequented the brewery there a couple times, and my favourite spot was a new little artisan shop that just opened up right across the street. I picked out this sweet little mug there, as any of you who know me know I can't turn down a nice mug purchase while traveling. Or any time. I made Dave pose for this photo, and because he is such a good sport and husband, he did it. This place was one of my favourites when I came here with my family back in '08, but it was closed the day we went there. I'd highly recommend it if you ever go to Twilly, though. The photo at the top of this post is of one of the other highlights. 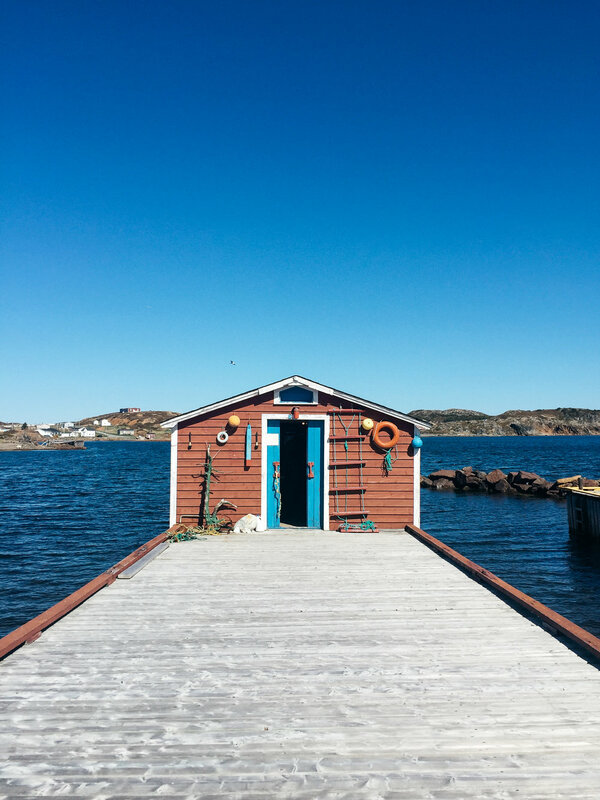 That cute little fishing stage is found in Durrel, which is right next to Twillingate. A sweet old man named Melvin owns it, and he calls it his "museum". Inside you'll find all kinds of knick knacks collected from over the years, including a MASSIVE collection of PENS from just about every country in the world. It's totally worth the little drive to have a chat with Melvin and see what's in there. 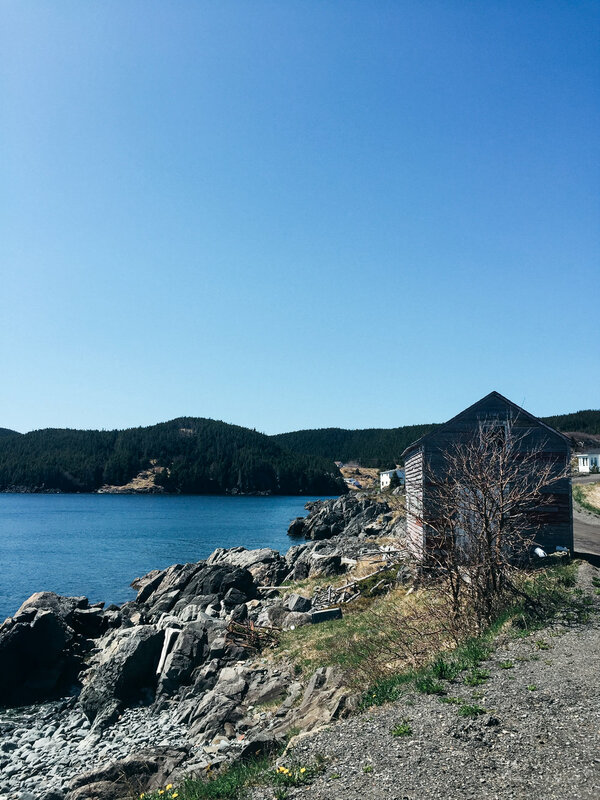 Before we headed back to Corner Brook on Monday, we took a long, scenic detour. There are a lot of abandoned homes and buildings in these outport communities. It's equal parts sad and fascinating to wonder about the people who lived in them, why they left and what life was like in the olden days. During our travels we came across a lot of these old homes, but this one stuck out to me for its vibrant colour. Not to mention the fact that the laundry on the clothesline next door means someone still lives right next to it. It's just such an interesting contrast to see signs of life next to places that have been dead to the world for many years. There are many times I don't like living in Newfoundland. The winters, the difficulty (and expense) of actually leaving the island, the lack of stores and services you'd find in larger cities. But I love learning about our rich cultural history and exploring the beautiful coastlines, and trips like this always increase my appreciation for both. I'm so proud to live here, where we can enjoy safety, fresh air, and quick access to the ocean. Some days I wonder if we'll ever have an opportunity to leave and if we would take it. I honestly don't know. For now, I'm grateful that winter is fully over and we're about to head into Newfoundland's prime season. And I highly recommend you make your way all around "the" circle and all the other outport circles Newfoundland has to offer. Who knows what other hidden gems you'll find. 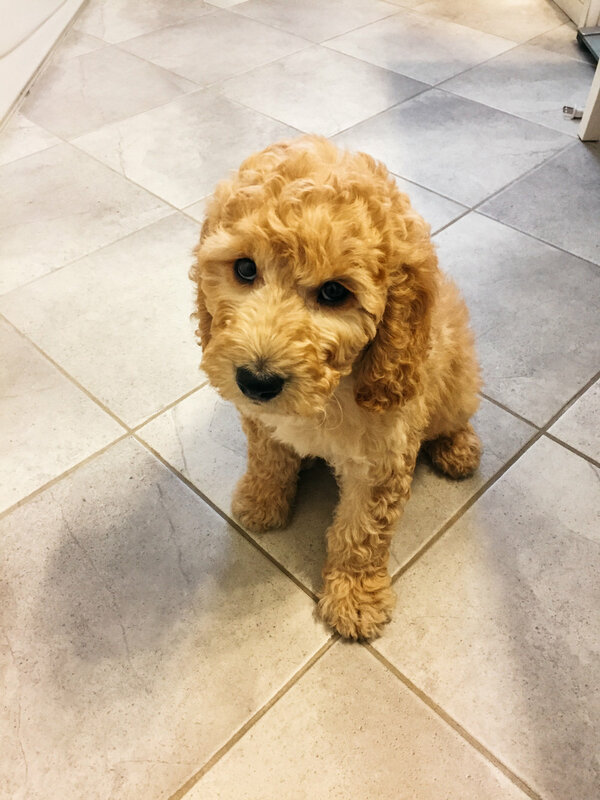 May 11, 2018 Robyn L.
We've had a puppy for two weeks, and our lives have drastically changed for the better. Before this year, Dave and I agreed we didn't want a dog. I grew up with dogs, but none of them really liked to be cuddled and the two we had the longest together barked incessantly at people and they could never make up their mind if they wanted to be inside or outside. Dave had never had a dog, so he didn't really know what life with one is like. We both figured it would be too much of a hassle to train a puppy and then not be able to just pick up and go whenever we wanted. But gradually, we started talking about getting a dog. I honestly don't really know why. Maybe it was all the cute puppy photos on Instagram. 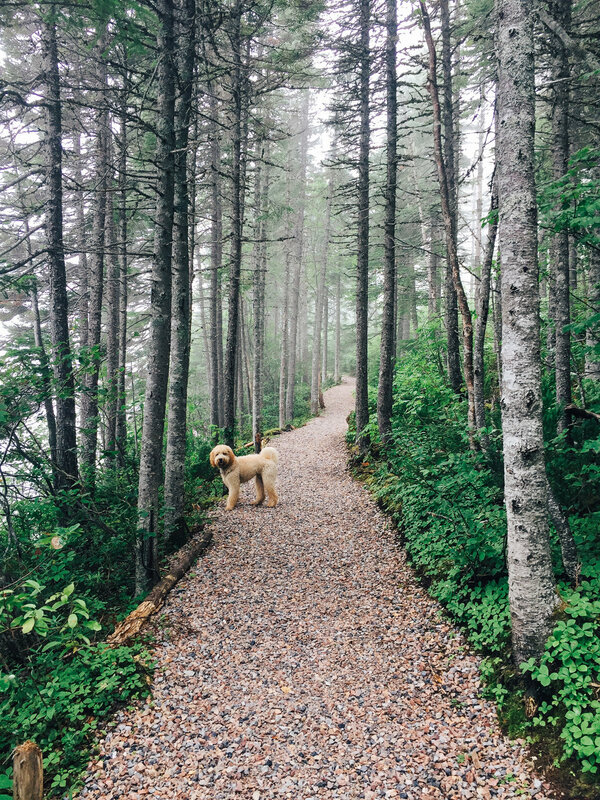 We know a couple of people with golden doodles and they seem to have great temperaments. Plus they don't shed. I started thinking it might be nice to have a little companion around the house, since I spend a big portion of the day at home alone before I start working. The more we thought about it, the more we realized we're not really spontaneous traveling types anyways, so the couple times a year we can't take a pet with us we could just plan ahead. We casually browsed Kijiji a few times to see if we could find a breeder nearby. Eventually I found one in Ontario that seemed to have a pretty good reputation and it turned out there was a litter of puppies that could go home in April. The timing was perfect, since we absolutely didn't want to be training a puppy in the middle of a NL winter. We paid a deposit in January and started a countdown. Dave started referring to the dog as our "Good Boye", but we officially named him Walter long before we met him. It just sounded like the perfect name, and also because our shared favourite movie is The Secret Life of Walter Mitty. I won't lie, we wondered a few times leading up to his arrival if we were making a mistake. We just didn't know what we were getting ourselves into. But we were still convinced this would be a good thing. When we finally did get there, he was in an office waiting to be picked up. As we walked out of the airport with this kennel containing a real puppy, we had that feeling described by many new parents: "So that's it, we can just take him? And then what?" Walter was really quiet and timid for the first two days. He only barked maybe once and I couldn't get over what a gentle puppy he was. He would cry every time I left his sight, and he couldn't get close enough to me. And ever since day three, we've had a normal puppy. Wanting to play and sleeping lots, biting every item of clothing you're wearing, sniffing and trying to eat everything off the ground. But oh man, do we love this little guy. We love his spunky personality, and how cuddly he is, and how much he just wants to be around people all. the. time. He's already learned that sitting and giving us his paw will get him a treat, so now when he wants pretty much anything, he'll sit in front of us and frantically wave his paw in the air. It's so cute it hurts me. The list of adorable things he does is endless. But I won't go on, because I know how everyone thinks their pet is the cutest and smartest, and we are most definitely just as biased. He's a lot of work, but he's one of my favourite decisions we've made and I love having him around when I'm at home by myself. We're certainly looking forward to the day he understands the concept of going for a walk and lets us know he has to go to the bathroom instead of having an accident inside. But until then, we're so happy to have our home totally revolving around this little fluffy, clumsy ball of joy. Hi and welcome! I'm Robyn and I have a lot of feelings about things.